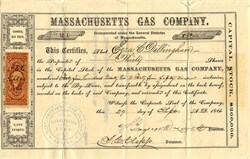 Beautiful certificate from the Massachusetts Gas Company issued in 1866. This item has the signatures of the Company's President, S. Ingersoll Lovett and Treasurer, I. C. Clapp and is over 142 years old. The certificate was issued to Ezra C. Dillingham. S. Ingersoll Lovett was co founder of the firm, Eaton, Lovett, & Wellington located at 117 Milk, house in Cambridge, Massachusetts. Eaton, Lovett & Wellington was a hardware store that sold American, English and German Hardware, Wooden Ware, Stationery,Fishermen's Outfits and a wide variety of other items from axes to whips.